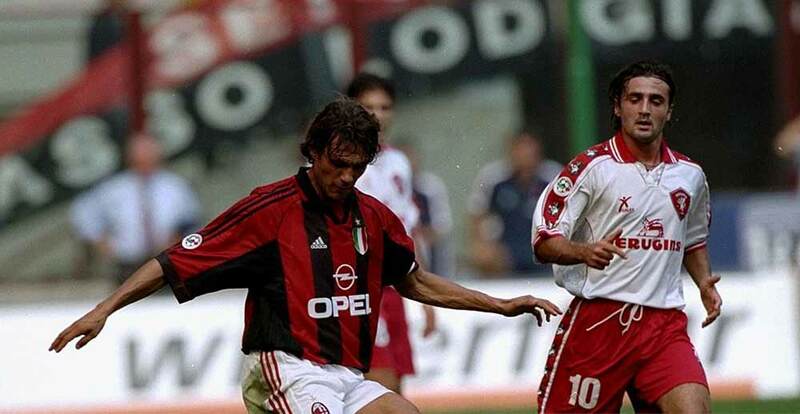 Angelo Pagotto reached the peak of his career in the 1996-97 season when he joined Serie A giants A.C. Milan after spells with Sampdoria and minnows Pistoiese. Giorgio Morini originally planned to use Pagotto as Rossoneri’s first choice goalkeeper, but by the end of the season he was only second-choice behind Sebastiano Rossi. 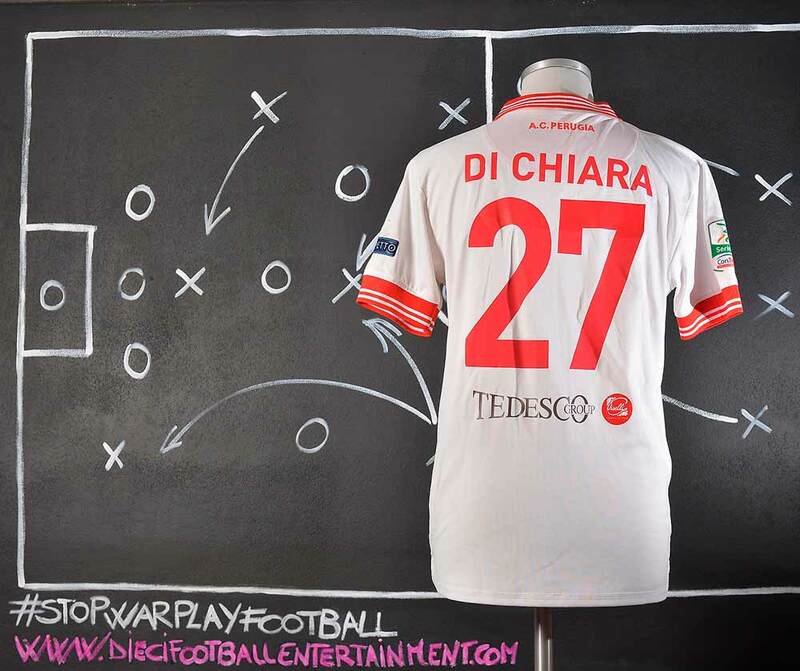 He spent just one season at Milan, making eight league appearances in the process, before moving on to fellow Serie A side Perugia. 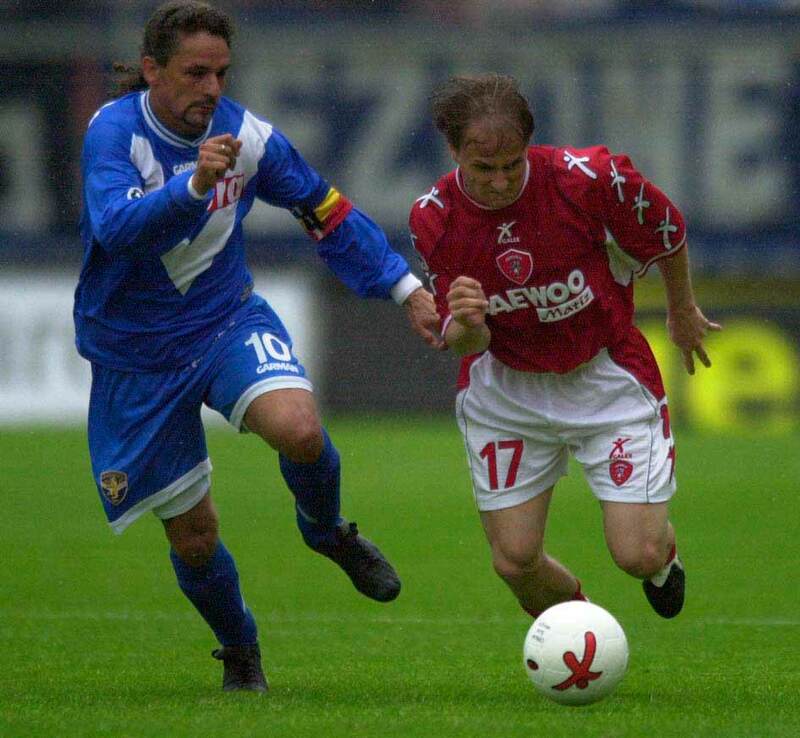 Following a short stay at the Stadio Renato Curi, Pagotto had spells at Empoli and Reggiana in Serie B before returning to Perugia for another season. 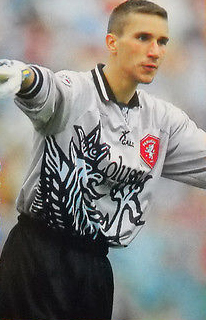 During the season 1997-1998 Pagotto was the first Perugia’s goalkeeper. 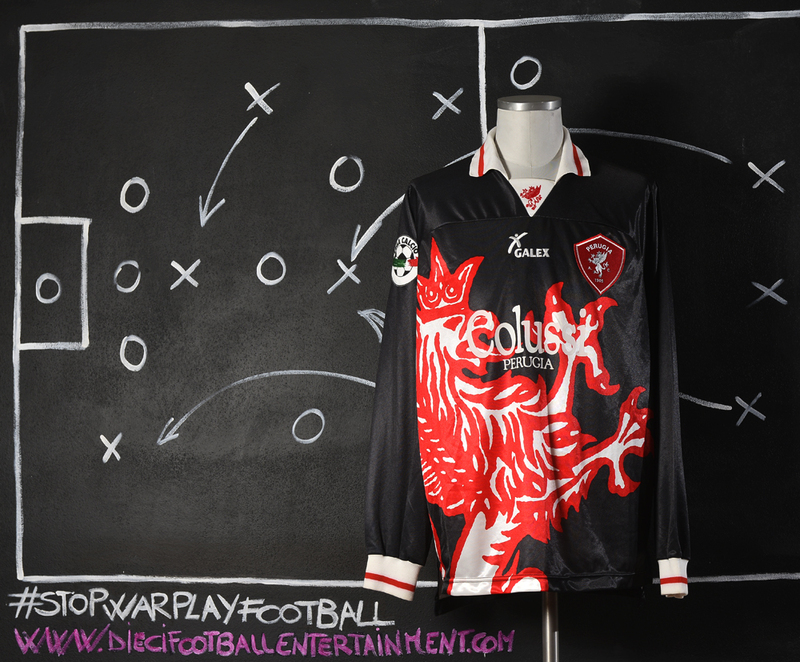 The season was an historical success because, even if the team changed three different managers during the season, Perugia went back to Serie A after the play-off game against Torino Calcio won after the extra time and penalty kicks. 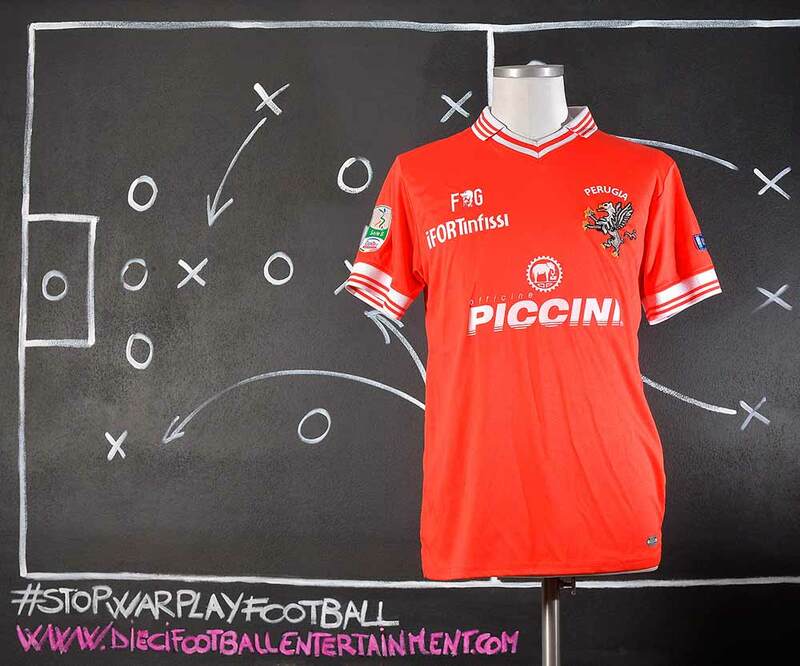 Marco Materazzi returned to Perugia in 1999 from Everton. 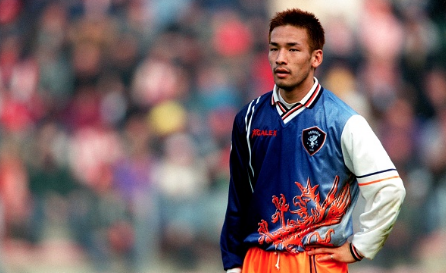 He played most of the games of the 1999-2000 season and he scored 12 goals in the 2000–01 season, breaking Daniel Passarella’s Serie A record of most goals by a defender in one season. 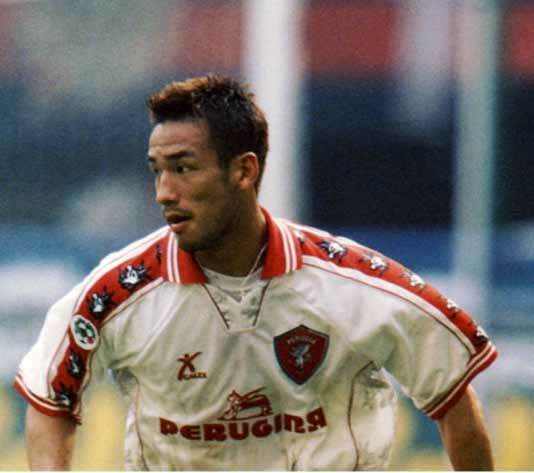 A regular in the Croatia national football team, he had earned 45 caps and scored five goals as of the end of 2004. Rapaić played two games for his country at the 2002 FIFA World Cup. He will be most remembered for his spectacular goal scored against Italy. 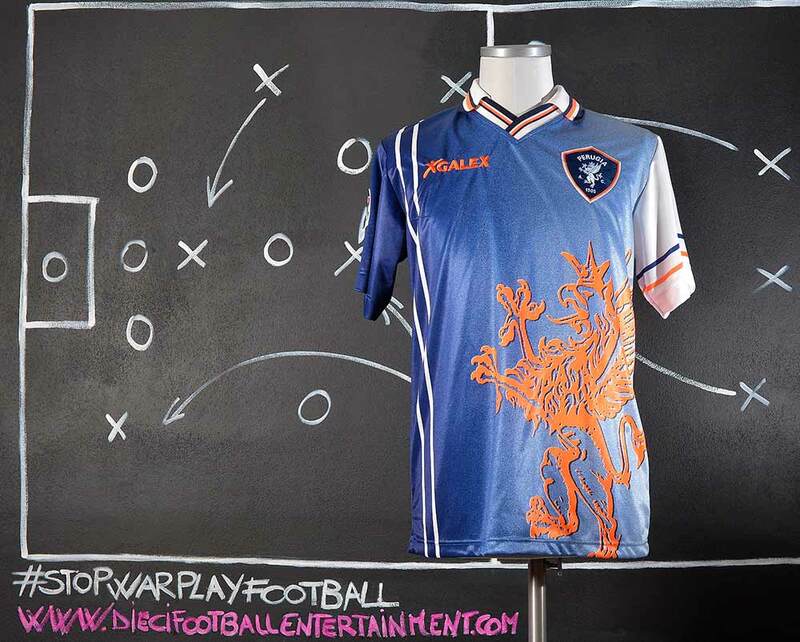 He also played three games for Croatia in Euro 2004 and scored one goal. 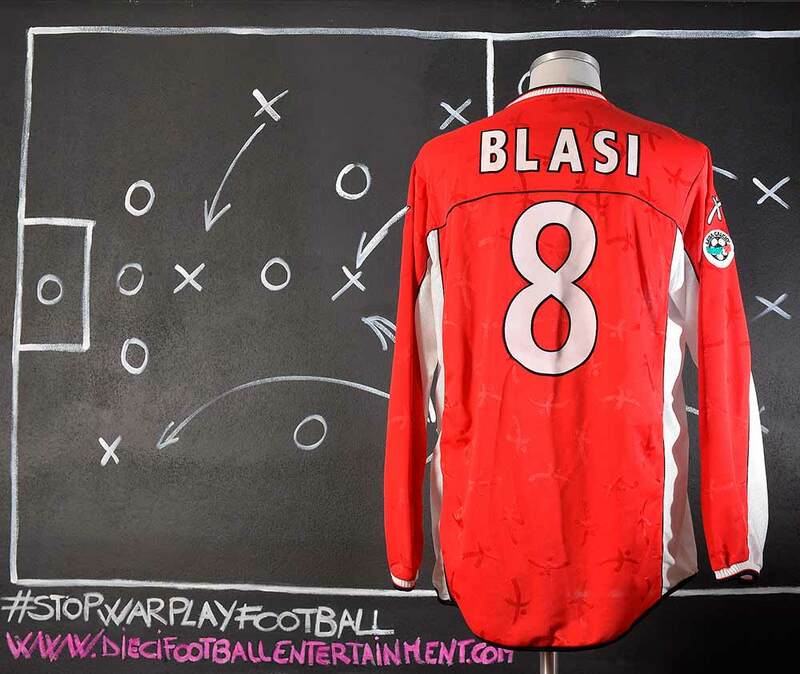 He has proved a fan favourite with his fun-loving playing style wherever he has played, and after impressive performances he once again earned a call up in August 2006 for the Croatian national side after missing the 2006 FIFA World Cup. 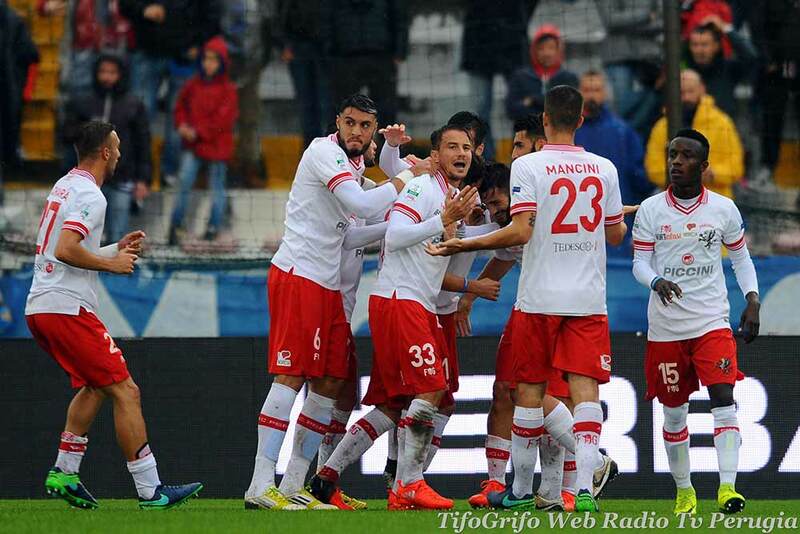 Croatia went on to beat the world champions Italy 2-0 in Livorno, with Rapaić playing a large role. 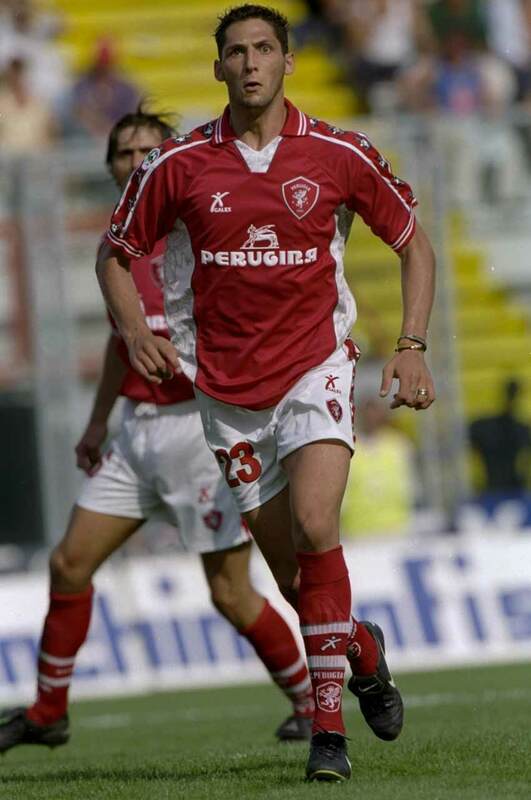 Andrea Mazzantini joined Perugia A.C. in the season 1999-2000 and he played until the end of the season 2001-2002. 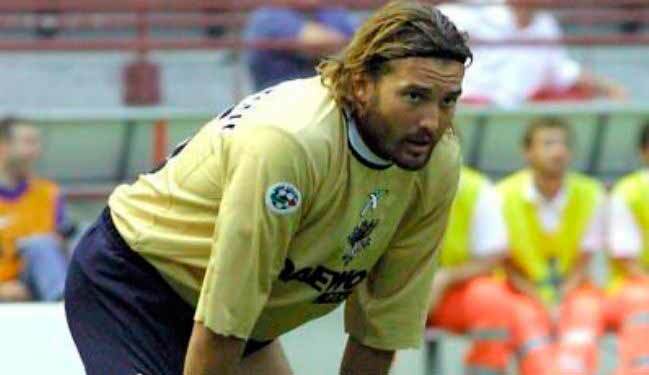 In the season 2002-2003 he moved to Siena but due a car’s accident he got heavily injured on his arm and he had to quit professional football. 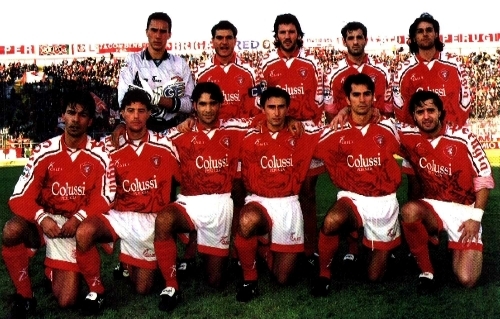 Gatti started his career at Perugia. 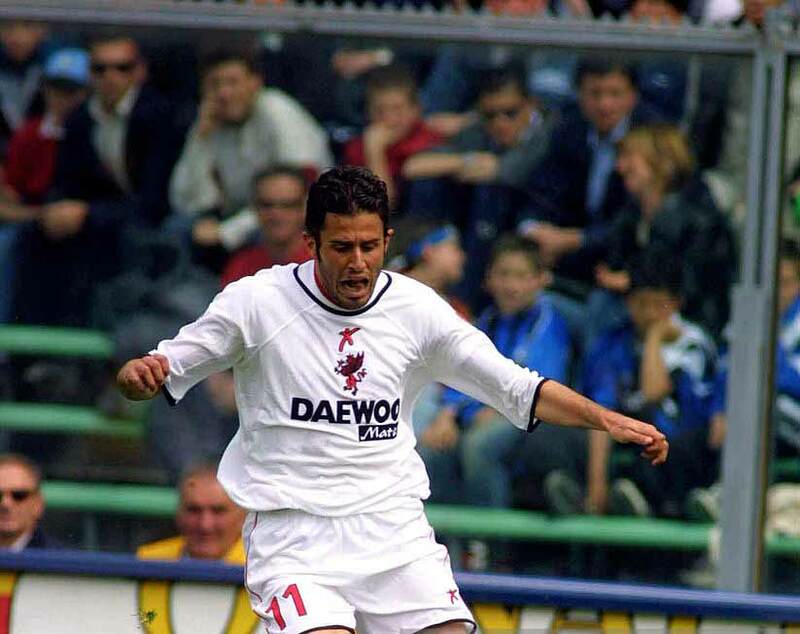 He played twice for the club at UEFA Intertoto Cup 2002 and once at Serie A before left on loan to Catania after the relegation of Perugia in 2004. 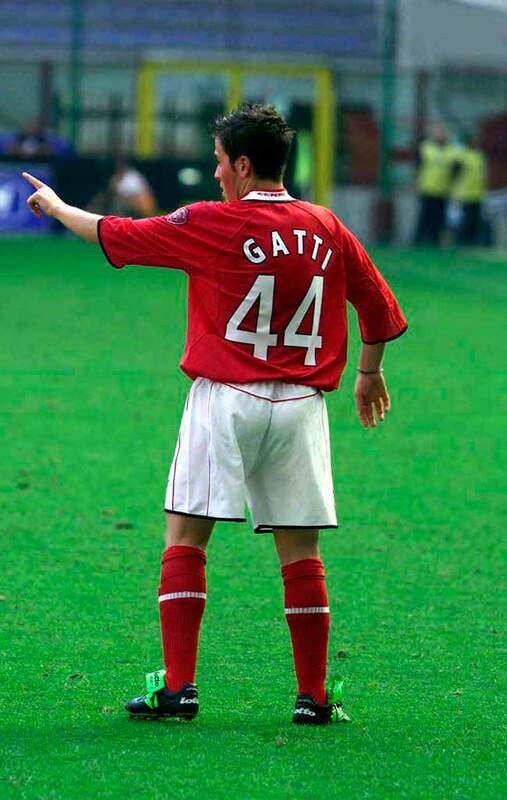 In the season 2001-2002 Fabio Gatti chose the 44 as shirt’s number. 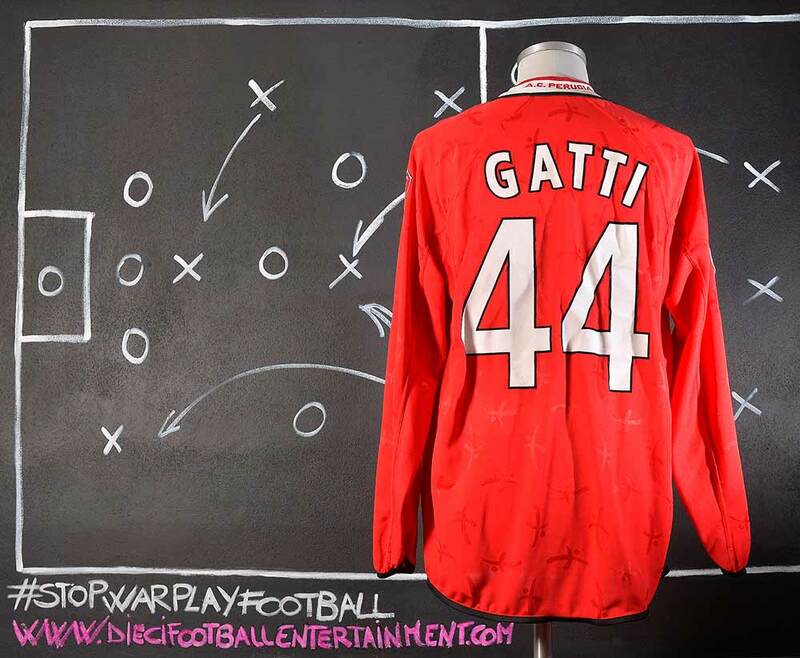 It was a funny trick to recall the “Zecchino d’Oro”kid’s song “Quarantaquattro Gatti”(44 Gatti – 44 Cats). 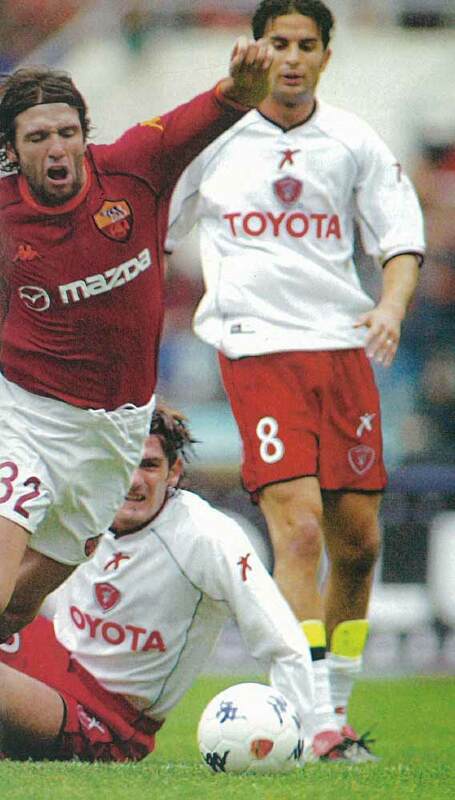 He officially joined Perugia Calcio of the Serie A in July 2001, and in his debut Serie A season, Grosso managed an impressive 24 appearances with a single goal. 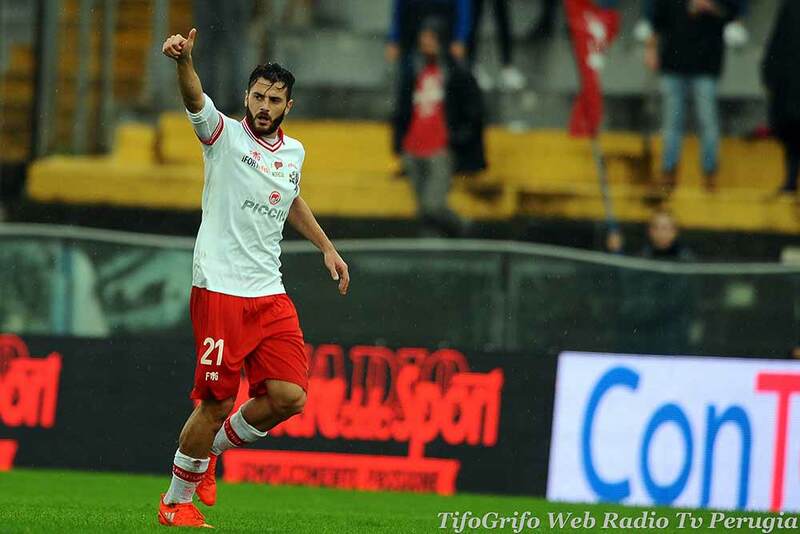 By now he had been converted into a left wing back by coach Serse Cosmi, and in his second season in Perugia, Grosso maintained a starting position and made 30 league appearances with 4 goals. 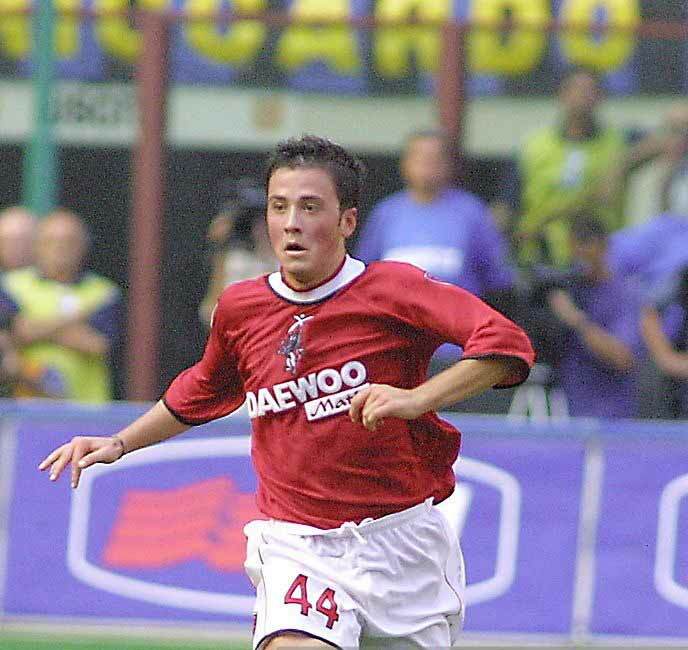 In his third season with Perugia, Grosso made just 12 appearances in the first 6 months of the 2003–04 season. 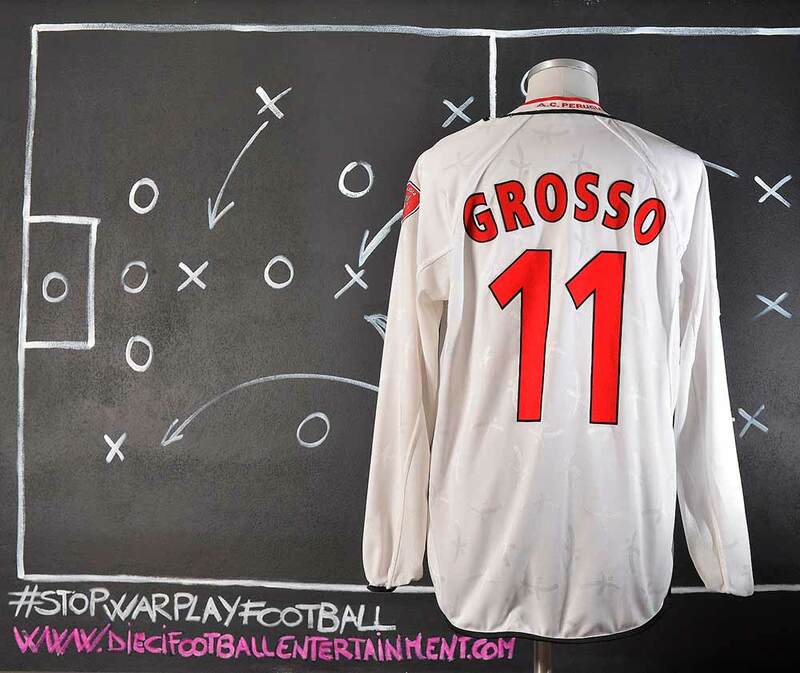 To some surprise, Grosso transferred away from Perugia in January 2004, and was sold to Palermo, who, at the time, played in the Italian Serie B. 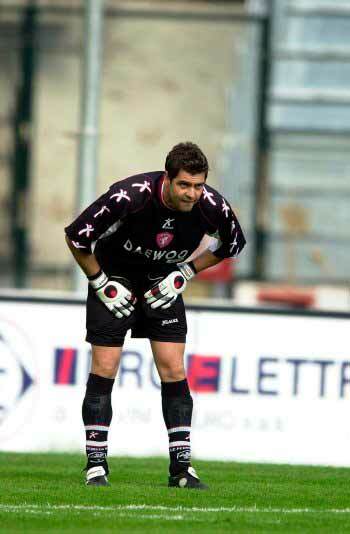 In 2003, during his time with Perugia, Grosso earned his first Italy cap. 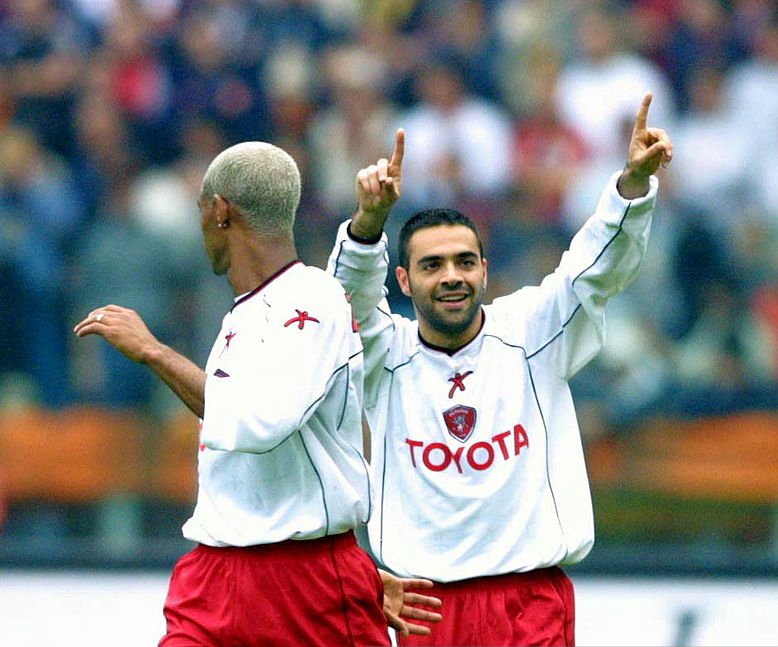 Fabrizio Miccoli scored 103 goals in 259 matches in Serie A, across nine seasons in representation of Perugia, Juventus, Fiorentina and Palermo, also spending time on loan to Benfica in Portugal; he later spent two seasons with his hometown club Lecce in Lega Pro. 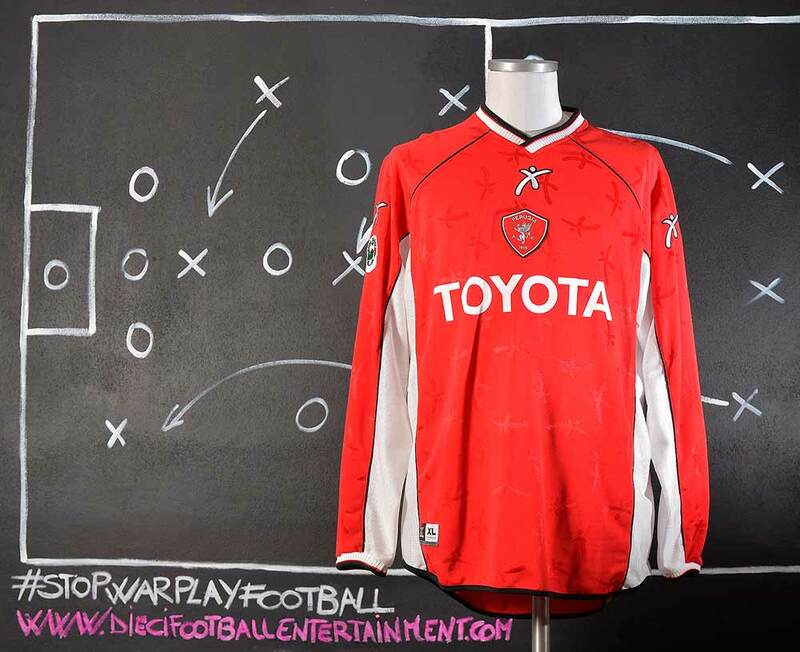 Following his impressive performances, Juventus showed interest in signing the player, and ultimately acquired his transfer rights from Ternana in July 2002, then loaning him to minor Serie A side Perugia for the 2002–03 season. 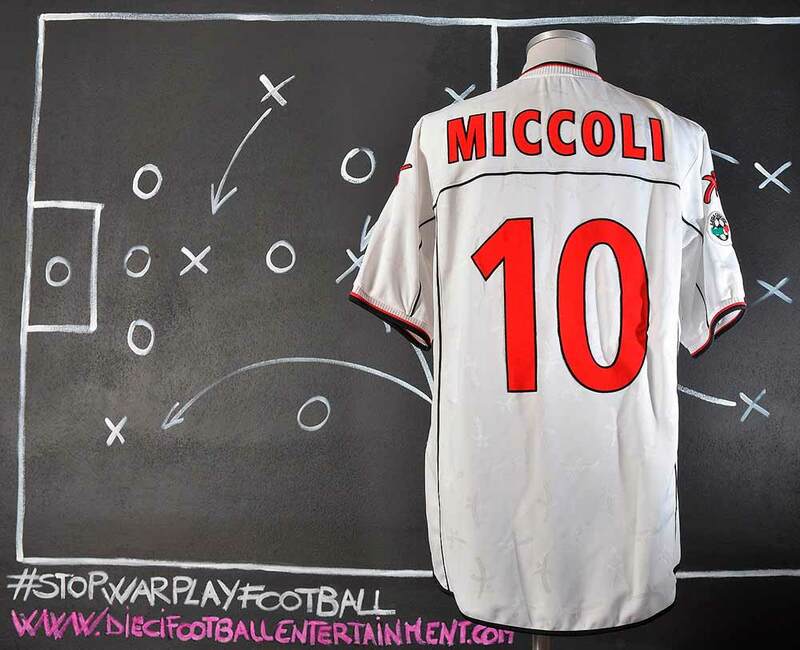 Miccoli showed great qualities during his first season in the top flight, scoring great goals and showing excellent technical ability. 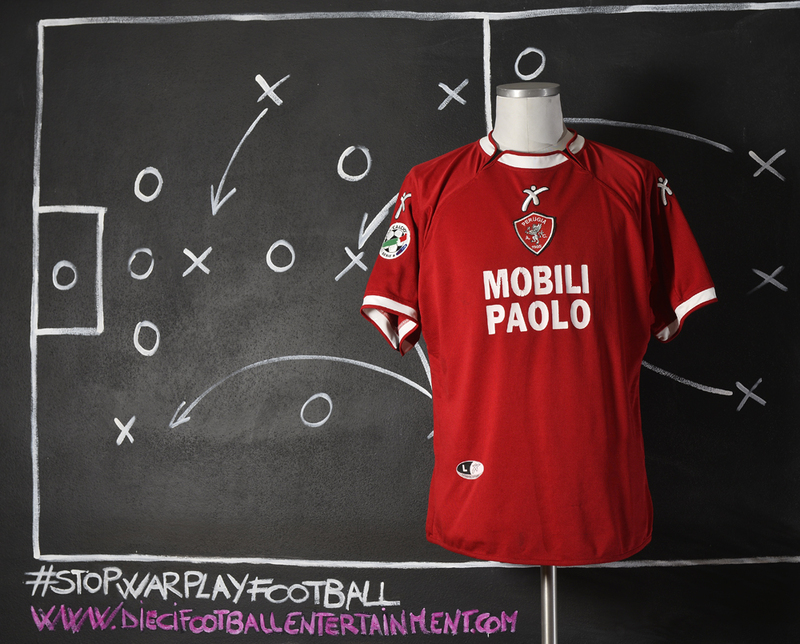 He was dubbed the Romario of the Salento, the Maradona of the Salento, and bomber tascabile (pocket bomber), due to his small stature, pace and his technical ability. 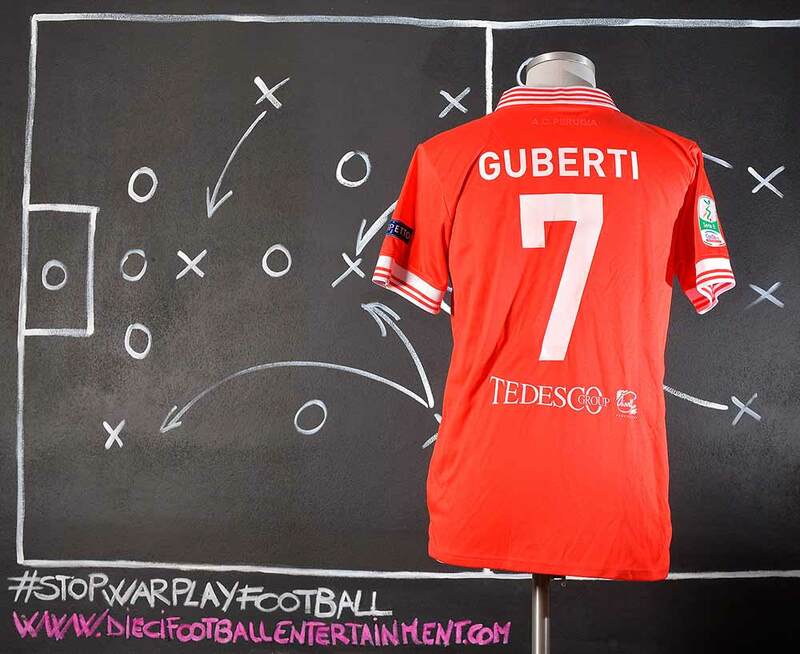 His efforts helped Perugia reach an UEFA Intertoto Cup spot. For his efforts, he received an Azzurri call-up during the season and Juventus recalled him back for the following season. 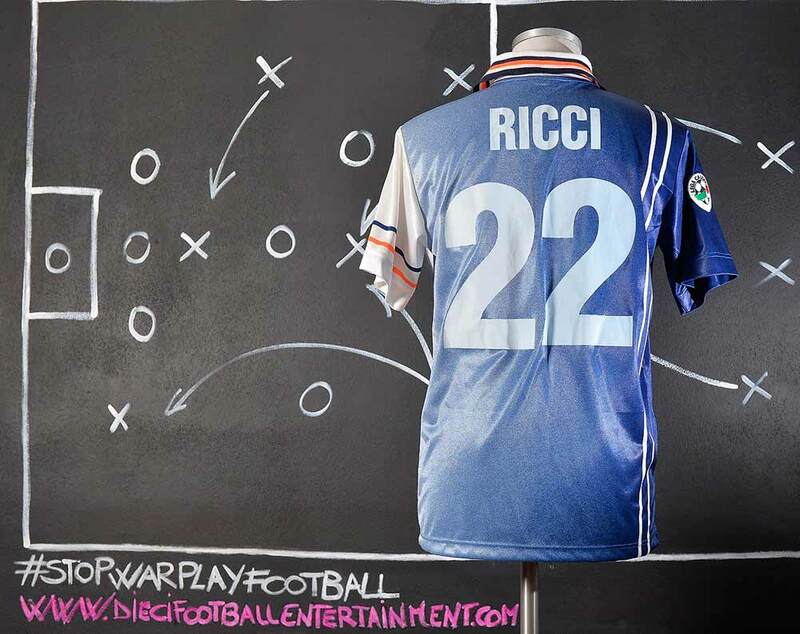 In a two-year international career, Miccoli scored twice in ten appearances for Italy. 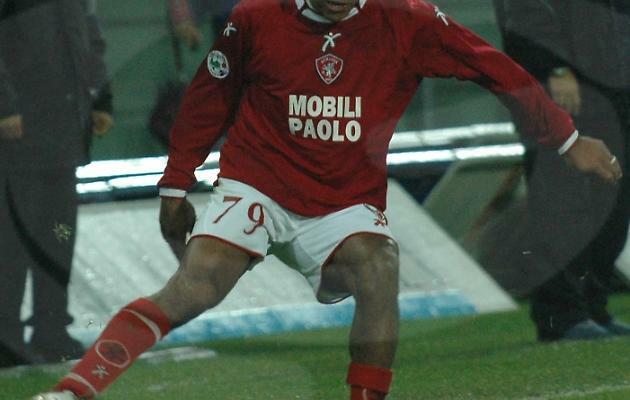 Al-Saadi Gaddafi (Saadi Gheddafi in Italian) signed for Perugia in 2003 under the president Luciano Gaucci. 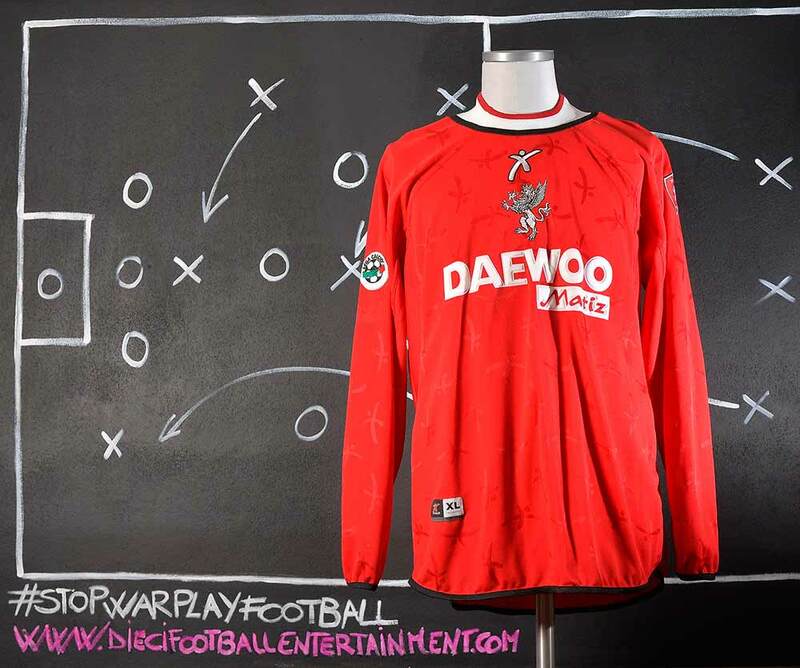 Saadi employed Diego Maradona as his technical consultant and Canadian sprinter Ben Johnson as his personal trainer. 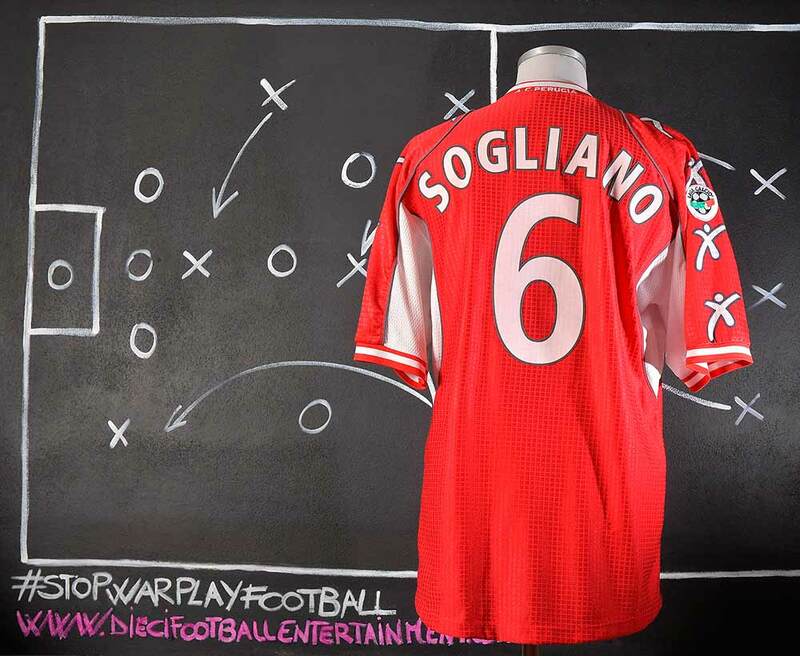 In the season 2003-2004 he made only one substitute appearance against Juventus F.C. 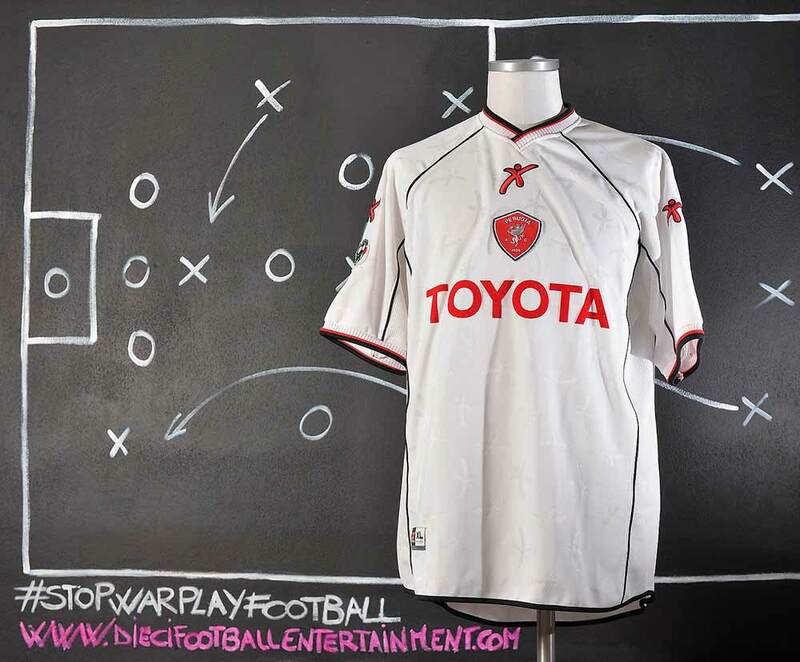 , the team that Saadi was shareholder and big fan of, becoming the first professional Libyan to debut in Serie A. 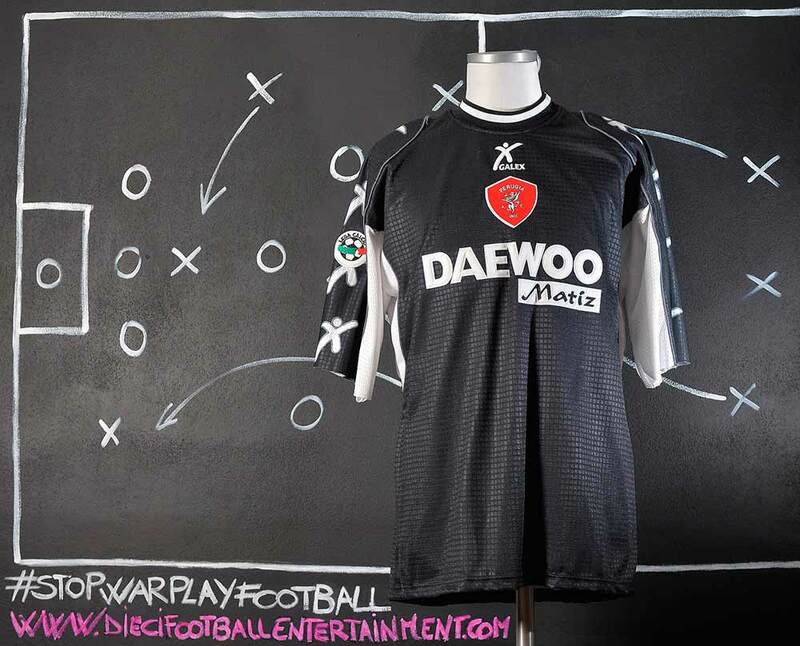 In the same season after the game against Reggina (he was a reserve player in the game) he failed a doping test and he got suspended by competitions for three months. 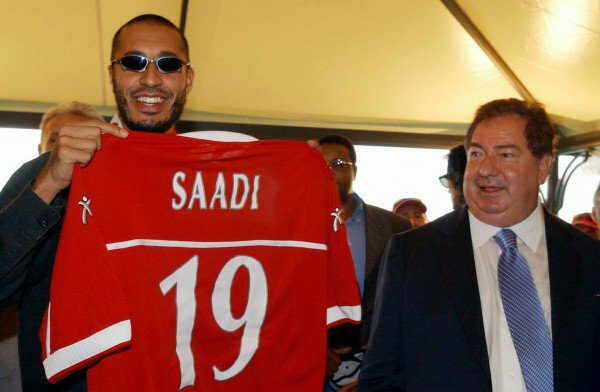 Saadi was never really considered a true professional player by press and most of the Perugia supporters. 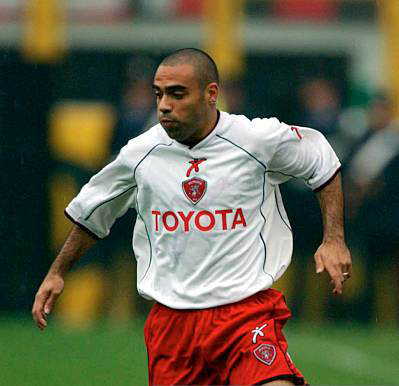 An article in “la Repubblica” (one of the most reputable and important Italian newspaper) said that “Even at twice his current speed he would still be twice as slow as slow itself.” In the season 2004-2005 he still was a Perugia first team player but he never played any game. 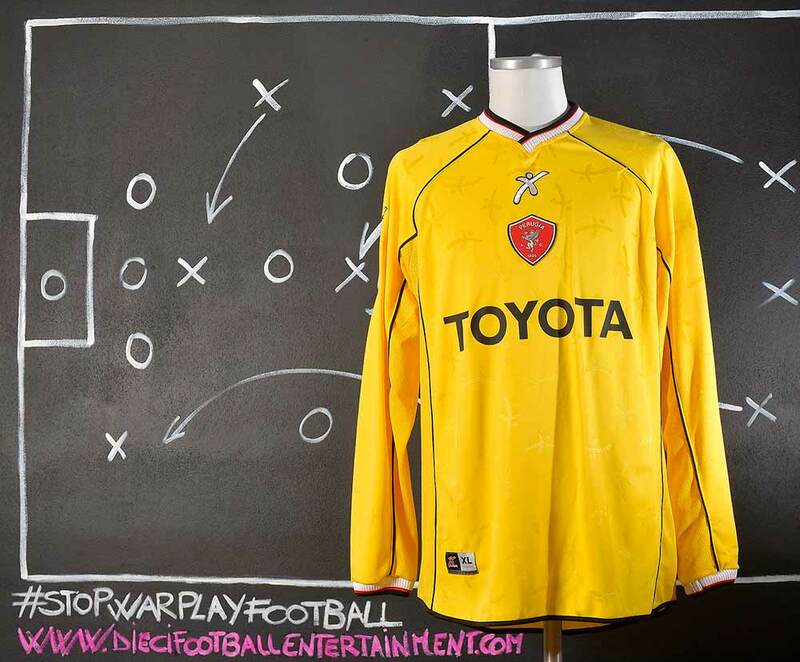 So this shirt was prepared for him but never used. 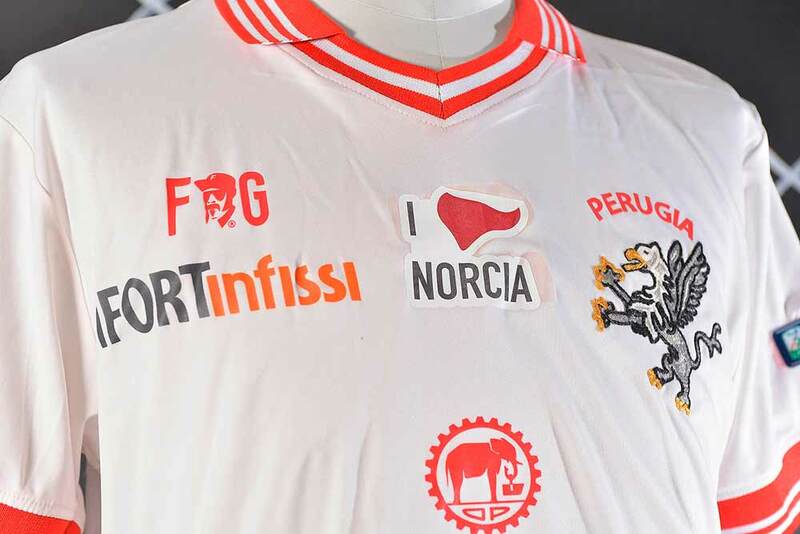 During the season 2016/2017 the team played several games with a special badge “I LOVE NORCIA”on chest. 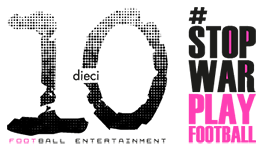 Norcia is the Italian place in Umbria that was almost totally destroyed by the earthquake that took place on August 24th 2016. 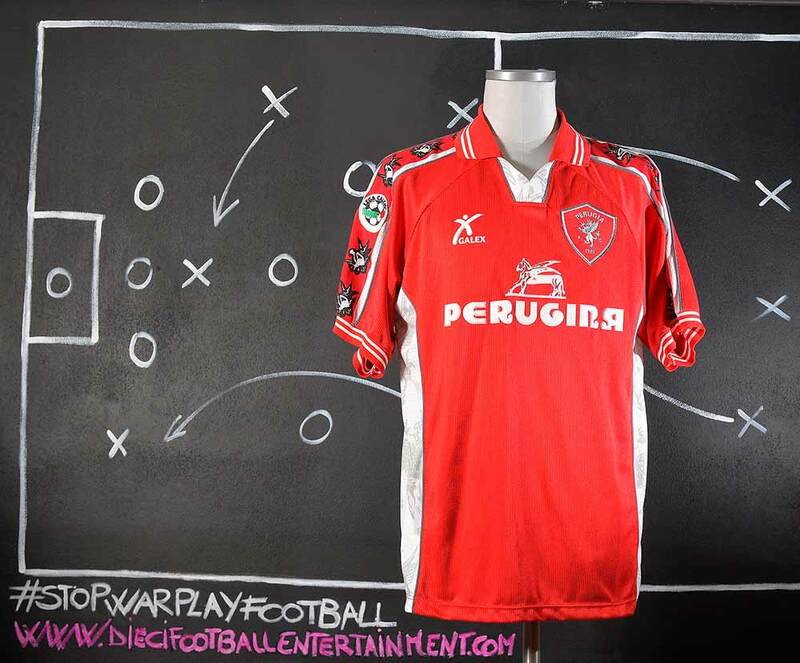 The Perugia team also devolved the 30% of several game’s incomes to support the Comune di Norcia.